The desktop.ini file is a hidden Windows system file. Windows uses it to identify how a folder should be displayed. It is visible when the user globally sets the system to display all the hidden system files and folders i.e. you can see it in windows file manager only if you checked ‘Show hidden files and folders’ in Folder Options by unchecking the check box. The file is peculiarly used to customize and adjust settings for the folders, which contain the file, of Windows OS. It is placed in every folder to instruct the operating system how to display and customize the viewing of that specific folder. It stores information about customized folders and one can customize folder background, change icon or thumbnail image to a folder and create info tip by creating a Desktop.ini file for that folder. The common use of the desktop.ini file is to use to it set a custom icon for a folder. After resetting the system settings to hide these files, the desktop.ini files no longer stay visible. Enabling the Hide protected operating system files (as recommended) setting in Folder Options hides the Desktop.ini files. To access the Folder Options, open Windows Explorer -> Organize -> Folder and Search Options -> View tab. The Myth about Desktop.ini Virus? It’s not a virus by default. Normally, desktop.ini is a safe Windows system file. There exist few known viruses that endanger the capabilities of the desktop.ini file. So it can be infected and since malware can hide itself by wearing a safe file name mask, it is important to find out where the file is located. Remember not to consider it as safe if you suspect something is wrong with your system. You can scan the file with an antivirus tool if you doubt it’s a virus. Rather, hiding such files gives a sleek performance of the operating system. However, the desktop.ini file gets disappeared, even with hidden shown, when you re-hid super hidden files. The prime step is to make the folder a system folder. This can be done in two ways: either from the command line by using attrib+s folder_name or by using Path Make System Folder. This sets the read-only bit on the folder to indicate that the special behavior reserved for Desktop.ini should be enabled. Now, create a Desktop.ini file for the folder and mark it as hidden and system to ensure that it is hidden from normal users. The created Desktop.ini file is required to be in the Unicode format so as to store the localized strings that are to be displayed to the users. If set to zero, this instruction avoids the warning “You Are Deleting a System Folder” when deleting or moving the folder. Set this entry to specify a custom icon for the folder. You can use either a .ico, .exe or .dll file. The icon is available to people viewing the folder over the network if the relative path is used. Set this entry to specify the index for a custom icon. If the file assigned to IconFile only contains a single icon, set IconIndex to 0. It is a string of text that will be displayed when you hover over the folder. Set this entry to an informational text string. It displays informational text when the cursor hovers over the folder. If the user clicks the folder, the information text is displayed in the folder’s information block, below the standard information. To prevent the folder from getting shared set this entry to 1. However, this entry is not supported under Windows Vista or later versions. Desktop.ini file is just window configuration file/settings that you could edit and do things like changing the picture of the desktop manually. This file can be safely deleted from any directory, thereby, removing any customizations set by the desktop.ini file. As this file consists of the settings associated with the folder that it contains, its deletion will change these settings back to default. Consider an example. When you create a new folder in Windows it is created with the standard folder icon. If that folder containing this file has been assigned a new different icon and if you delete the Desktop.ini file, then the default folder icon will be re-established or re-enabled. However, trial of deletion of these files can be frustrating as the Windows OS may rebuild them up. The deletion of Desktop.ini may go fail if it is locked because it is in use by some application. Thus, in order to delete those files, use program called ‘Unlocker’. Now, we are totally aware about what actually the Desktop.ini file is and whether it’s a virus or not. Additionally, we went through the customization procedure of Windows folders using the Desktop.ini file. So, don’t get scared of such files and rather keep your antivirus programs active to scan out the files if these tend to be malware. Hiding them or not is the user’s decision, but choosing the former option will definitely give a smooth experience of working with Windows folders. Hope all you readers are clear with idea and if not, do feel free to ask the queries. Hi Aish! Thanks for this informative post! I appreciate your hard work Great Job! 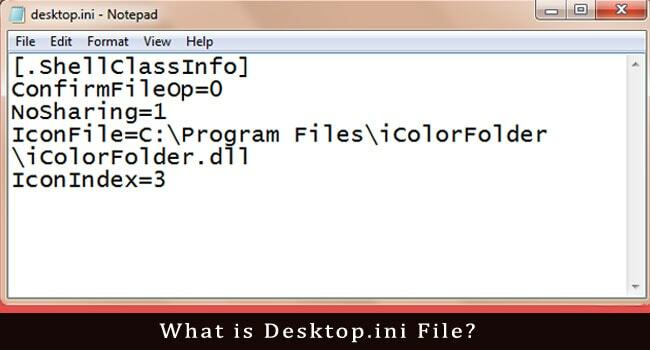 Thanks for clarifying this.. Now I know exactly what desktop.ini file is..
Hi Aishwarya, thanks for letting us know about Desktop.ini.file and for clearing that it is not a virus. But I would like to know whether it is useful for all the windows? Yes, it does work in all Windows. Just note that there are some different specifications for different versions of Windows, e.g. for icons on Vista you need to use IconResource instead of IconFile. But it may not be useful in every case, e.g. you can use it to change the icon only on an empty folder in Win7 and Vista. So, users may find it useless sometimes. Through this article, I understand what is Desktop.ini file. Thank you so much!